LIKE CLICHÉS, bands reach "institution" status on account of being time-honored and reliable. But while reliability can be a positive trait, it also carries the flip side of predictability. In terms of Japanese indie pop, there's no other institution quite as iconic as Shonen Knife, which was founded in the very early '80s by sisters Naoko and Atsuko Yamano and friend Michie Nakatani. Naoko took on vocal and guitar duties, Atsuko drummed, Michie played bass, and all three were working tradition-bound office jobs when the band was born. The music was sweet yet primal lo-fi punk and pop that struck a major chord with hipsters across the Pacific. Its refreshing nonconformity in the face of Japanese schoolyard and corporate clone culture translated well to disaffected youth globally. Closet overseas fans first took notice in 1989 when the Shonen Knife tribute album Every Band Has a Shonen Knife Who Loves Them featured bands like Sonic Youth, L7 and Red Kross covering SK classics "Twist Barbie" and "Flying Jelly Attack." "I'm very happy about that album," writes Naoko Yamano, in an email interview. "Many cool bands played our songs with their cool feeling." The group's profile skyrocketed when it toured with Nirvana in 1991. Kurt Cobain gave Shonen Knife an endorsement of a lifetime: "When I finally got to see them live, I was transformed into a hysterical 9-year-old girl at a Beatles concert." "We toured with him twice in U.K. and U.S.," Yamano writes. "One day when we were touring, he asked to me how to play the guitar chords of our song 'Twist Barbie.' So I told the chords to him. Then I heard that he played the song at Nirvana's secret gig. I'm very proud of it, because he is a great rock artist." Of late, it's been all quiet on the Shonen Knife front--at least from a Westerner's perspective. Fans who thought they could count on a regular infusion of Shonen Knife madness found the band's 1998 Happy Hour to be the band's last to album released domestically. 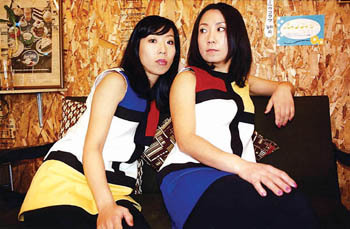 In Japan, Shonen Knife has remained prolific, recording full-lengths (Candy Rock, Strawberry Sound), a DVD (Blast Off) and a hits collection (Millennium Edition). South Bay Knifeheads can now rejoice. The group's most recent album, last year's Heavy Songs, is being released domestically on Oct. 14 by Confidential Records. Shonen Knife will also kick off a 16-city, 19-date North American tour at the Blank Club in San Jose. But Shonen Knife an institution? The band broke through to a U.S. audience yet managed to remain together and sustain a creative career, longer than other Japanese acts pushed to Western ears, like Kyu "Sukiyaki" Sakamoto, Toshi Kubota, even Pizzicato Five. That's not to say Shonen Knife's roster has remained entirely unchanged. Nakatani exited the band in 1999, and the group made a slight adjustment. Atsuko, multi-instrumentalist and designer of the band's Mondrian-inspired outfits, stepped out from behind the drumkit and took over on bass. Mana Nishiura now drums. "Since our former bassist Michie left the band in 1999, I didn't want to change the image of Shonen Knife," Naoko writes. "I thought if Atsuko became the bassist and stood in the front of stage, the image of the band wouldn't change. So I asked her to play the bass." Heavy Songs features some of Shonen Knife's trademark hard, fast and friendly-sounding songs. Closing out the album is the epic and happy "Mango Juice (A Tribute to George Harrison)." It respectfully references two other institutions: one a rock legend and the other a tasty beverage. "I really like mango juice. It is usually served at Indian restaurants," she writes of the song's origin. "For the lyrics, I used sitar sound. In the same year, George Harrison was dead. The Beatles is one of my favorite bands, and I know he liked Indian music. So I dedicated this song for him." Shonen Knife plays Wednesday (Oct. 8) at the Blank Club, 44 S. Almaden Ave., San Jose. Tickets are $12 and are available through Ticketweb. From the October 2-8, 2003 issue of Metro, Silicon Valley's Weekly Newspaper.